Analysts at HSBC argue that the consensus is for US dollar weakness but that they’re contrarians and calling for strength. Given that US dollar longs are extremely crowded in the CFTC report, I’m not sure I agree with the premise that USD-longs are contrarian but they make a solid argument for dollar strength. Rates may be moving closer to neutral, but this is not the same as the peak rate. Doubts remain about when and how quickly other central banks will raise rates. Also the level may matter not just the rate of change. US growth estimates are being revised upwards, while the Eurozone needs growth to recover just to meet existing forecasts. Survey data in Eurozone remains challenging. The market seems to assume a Eurozone recovery but cannot explain the big growth miss so far in 2018. Eurozone has its structural frailties too, as Italy’s tribulations illustrate. Internal Eurozone imbalances are difficult to address. Fiscal issues can open the question of whether the EUR is divisible, while the USD is not. EM does not offer value and those that are ‘cheap’ reflect their risk profile. Foreigners still own much of the local market suggesting little clear out and therefore less scope for a rush back in. Macro frailties remain. 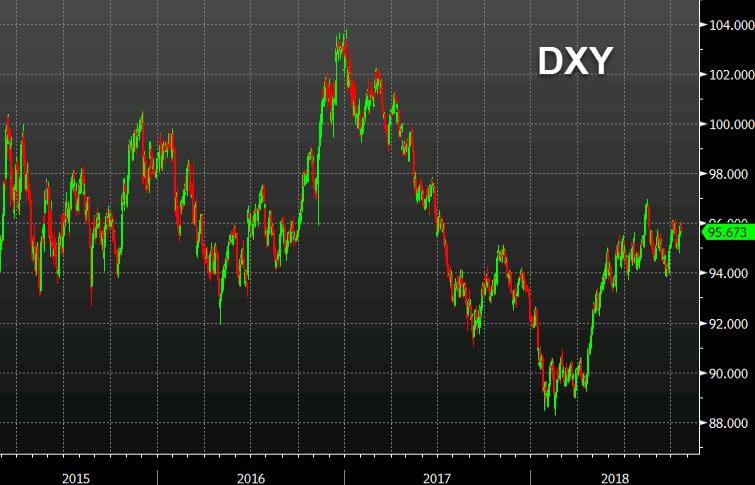 The USD has continued to rally on a broader basis, even if this is not fully captured by the DXY. The USD is not expensive on our metrics, and has room to catch-up with these developments. I’m not sure I agree but it’s nice to read some thinking that’s outside the box and some forecasts that include decent-sized moves.